That’s write, chocolate! Will Clower, PhD, Founder and CEO of Mediterranean Wellness, is currently working on writing a new book entitled Eat Chocolate, Lose Weight, which will make a believer even out of the biggest skeptic. 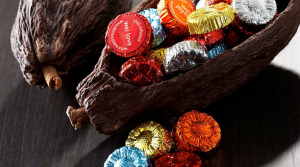 Clower said that the way to make this miracle happen is to start by realizing that chocolate is an outstandingly healthy food, rich in antibiotic, anti-platelet, cholesterol controlling benefits. BUT he said the key was to choose the right chocolate and to consume an appropriate amount. What is the right chocolate? He says it’s one with high levels of cacao. So do your heart a favor, eat luscious high cocoa chocolate! Not sure where to grab the good for you option? Complexions has you covered. 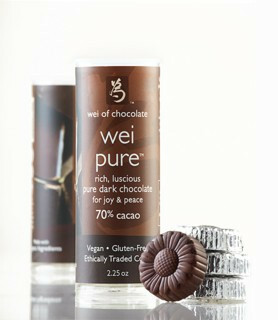 Try Wei Pure, an organic, fair trade, vegan, gluten free, soy free, 70% cacao dark chocolate. 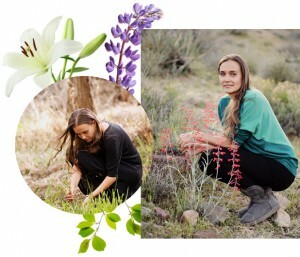 The dark Wei Chocolate variety is designed specifically to bring more joy, strength and inspiration into your life with the addition infusion of hand-collected flower essences from Lotus Wei. Though the essences create no additional flavor, they do work on your acupuncture meridians to balance your body and mind. With only 2 grams of carbs and 30 calories per piece, Wei Pure is the perfect healthy chocolate to let melt in your mouth whenever you need a two-minute break to remind yourself to breathe deeply and expand your energy. Then consider the internal health and weight management benefits…this snack becomes a must!